A silver Toyota Rav4 caught fire and exploded in University of California, Santa Barbara’s Mosher Alumni House parking lot at approximately 3:00 p.m. on Thursday, May 2. UCSB students and faculty alike gathered around the steps of Campbell Hall as police officers calmed the crowd and established a perimeter around the flames. A battalion of firefighters milled around the parking lot, dragging hoses and working to bring the situation under control. A trash can next to the enflamed vehicle was set on fire prior to the car’s explosion, and by the time it was extinguished the can had been burned to the ground. 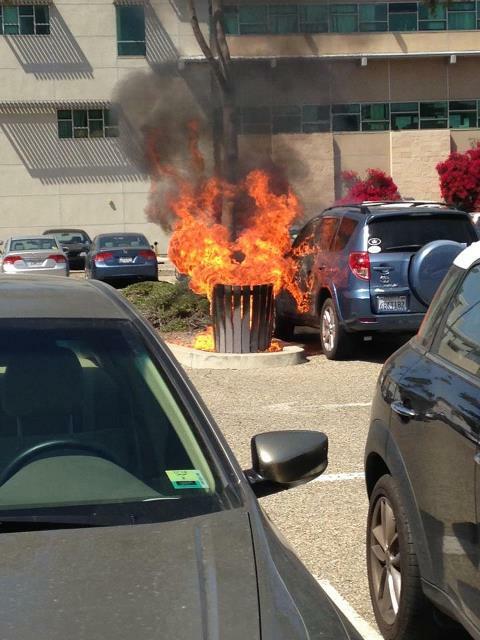 None of the witnesses could say how the garbage can came to be on fire. Police and bystanders alike commented upon the quick response of the UC Police Department officers and the firefighters. Police Chief Olsen lauded the emergency response team for bring the flames under control quickly and effectively, and mentioned that this Thursday’s heat—with a high of 80 degrees—made it a difficult day for dealing with fires.